Children love interactive and creative role-playing. When we were children, we wanted to grow up and do what grown-ups can do. With the KidKraft Large Kitchen set kids will have hours of fun pretending that they are cooks in their own kitchenette making meals for the family. Don’t you just miss those times when you also love playing with such toys back when you are young? I’m sure you do, and in the same way, kids will really like it to. If I were you I would clear some space in your home for this toy that is large and includes realistic features for active, creative play. Develop your kid’s imagination with this toy! Let your kid cook up some of her own meals in this playset. 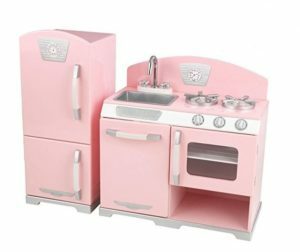 This is the ultimate cook room set that kids will love because of the lifelike burners and other features that can be found in this set. All this toy requires is an uncluttered corner in your house or apartment as well as plenty of imagination from your kid. The appliances and furnishings included in the set are a stove, oven, microwave, sink, and refrigerator. They all look so real that she might really think she’s just standing in your kitchen. She can open the fridge to get her ingredients and then “cook” food in the burners. You will find that the burners were also realistic. The oven and microwave have see-through covers so the kid can check on the food while it is cooking. The sink can be removed for easy cleaning after a day of creative cooking. The shelves above can be used for storing the supplies. The doors and knobs are all working, and children will really enjoy opening and closing them. The colors are vibrant and pleasant to the eyes. If you prefer colors that are easier on the eye, you should look into the Step 2 playset. This is a big set which measures 42 x 16 x 42-inches (HxDxW) and weighs 83 pounds. It is easy for children to work in their kitchen without hunching over. The big set is ideal for families with multiple children. This is the perfect place for them to bond and spend time together. You can also place this furniture near your own cook place where kids can cook dinner alongside your own REAL family meal. That sounds really exciting, doesn’t it? 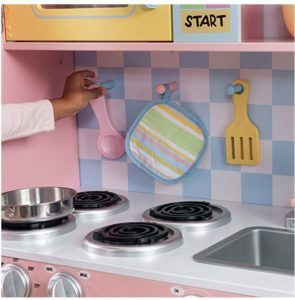 If you have crafty kids at home, you must get the Kidkraft Pink Retro Kitchen. This is a big playset for your little cooks. They can also share the set with their playmates after school or on weekends. The toy is gonna be an excellent source of fun for the whole pack! This toy is also available in white, blue, and lavender. If you have a little kid who loves to help you out while you are cooking and preparing the family’s meals, this would be the best gift you could give her on her birthday or this Christmas. Let your child make his or her meals and have hours of creative fun with this big set that you can buy for her entertainment. 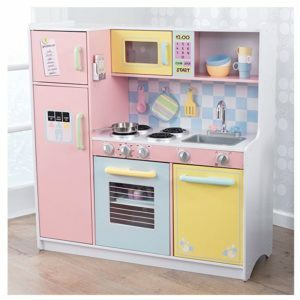 The colorful kitchenette playset has the amenities of a real kitchen. Your child will really have endless hours of cooking fun with this toy because of the countless possibilities that she can prepare her meals. If you have enough space in your cookery for this set, why don’t you put it there so she can cook alongside you? The doors and knobs are all in perfect working order. The kid can open and close them at will. The knobs on the oven and sink can be turned so the young cook can wash the dishes and set the cooking time in his own oven. The sink is actually removable so that you or your children can quickly clean it up after a day’s play. The toy includes several appliances that your kid must be familiar with. Your child will have her own refrigerator where she can store her ingredients that are perishable the way you keep eggs and meat as well as vegetables in the fridge in your kitchen. There is also a freezer and an oven as well as a dishwasher. The color and intricate design will not only be appreciated by kids, but it will also remind parents of their childhood. It is made of wood and recommended for children aged 3 years to 5. 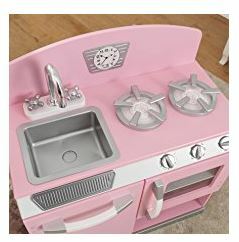 Surely they will get loads of fun with the kitchenette playset if you get some of the cooking sets as well.